South Korea's military warned Thursday that North Korea will pay a harsh price for an attack on the South or its ally the United States. The Joint Chiefs of Staff issued the strongly worded message in response to the North's continued war rhetoric, including a threat to fire ballistic missiles toward Guam. Should the North ignore the warning and provoke, it will face "the allies' strong and resolute retaliation," Army Col. Roh Jae-cheon, the JCS spokesman, said in a statement. It's unusual for the South's military to issue such a warning message against the North for verbal threats, not missile or nuclear testing. He denounced the North for a series of "reckless rhetoric" such as "turning Seoul into sea of fire," "pre-emptive retaliatory operation" and "enveloping fire around Guam." "It's a serious challenge to our people and the South Korea-US alliance," he said. The allies are all set to counter the North's provocation immediately and sternly, he stressed. He would not go into details of specific scenarios the military is considering. Asked about a possible indication of the North's immediate provocative act, he said, "There's no peculiar activity detected yet." Meanwhile, the defense ministry said the secretive nation is believed to have made "considerable" progress in miniaturizing nuclear warheads. 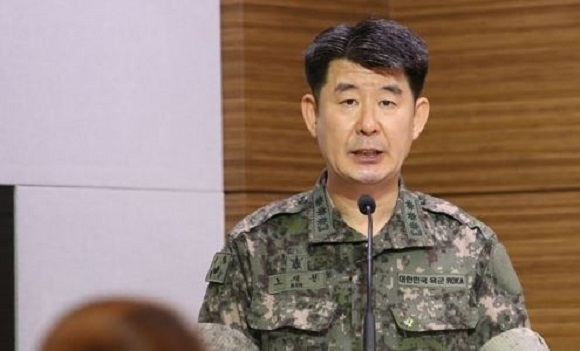 "It's assessed that the North has reached a considerable level of technology, given the time for other countries with nuclear weapons to achieve the miniaturization," the ministry's spokesman Army Col. Lee Jin-woo told reporters. He pointed out that a decade has passed since the North's first nuclear test. Earlier in the day, the strategic force of the North's military said it's working on a new operational plan to hit the waters near Guam with four Hwasong-12 mid-range ballistic missiles that would fly over Japan. It's aimed at interdicting US bombers and nuclear-powered submarines, the North said.